This was mentally a stressful week. I had to figure out bar-top and flooring for the hallways and the main area out front – basically trying to pull everything together. 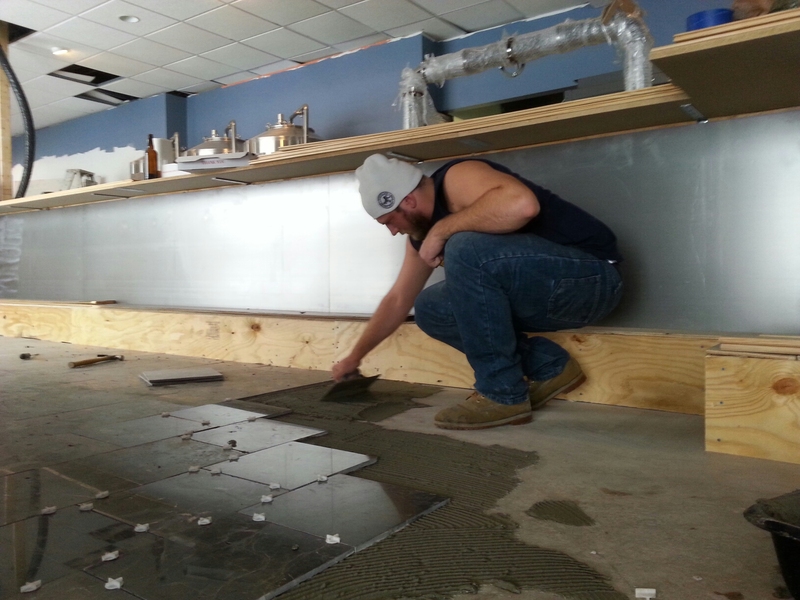 The floor can’t be expensive, but has to be durable enough for commercial use. 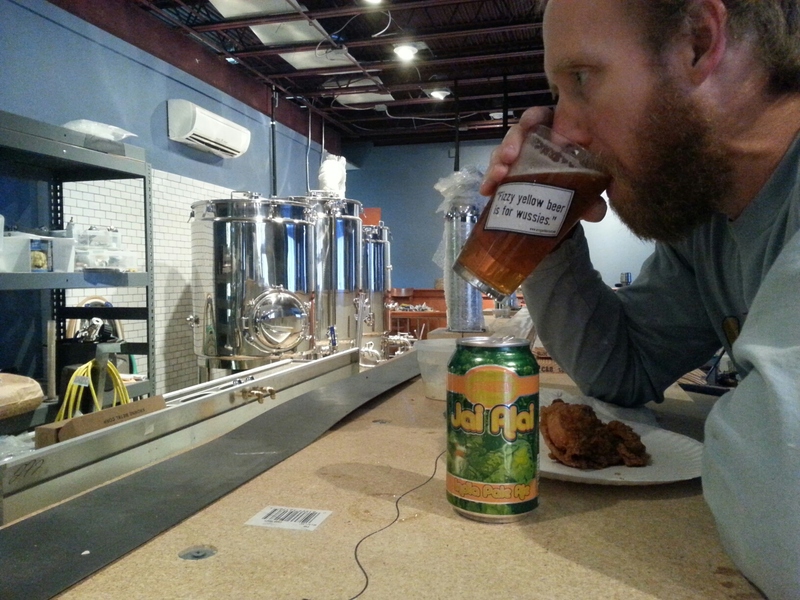 The bar top was even more difficult as I just haven’t been able to figure it out. 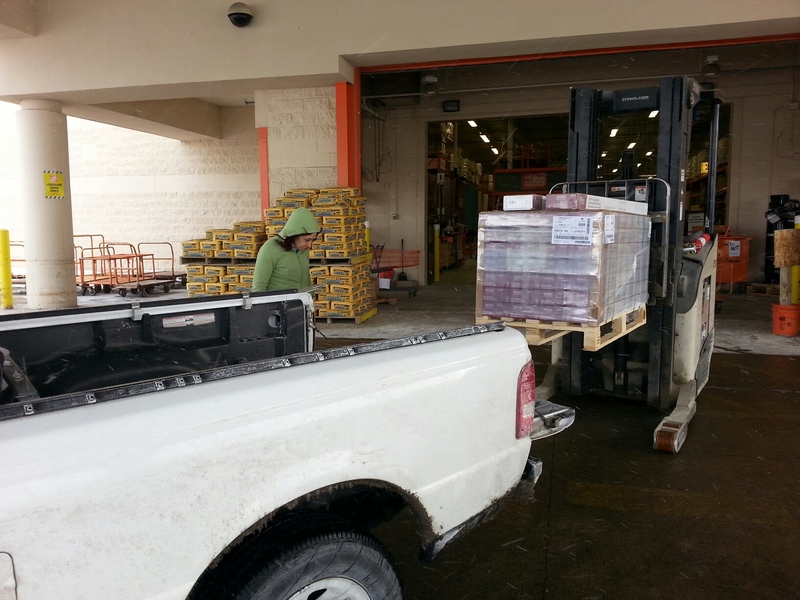 For the flooring my wife and I paid a visit to many flooring places: Lumber Liquidators, Lowes, Home Depot. 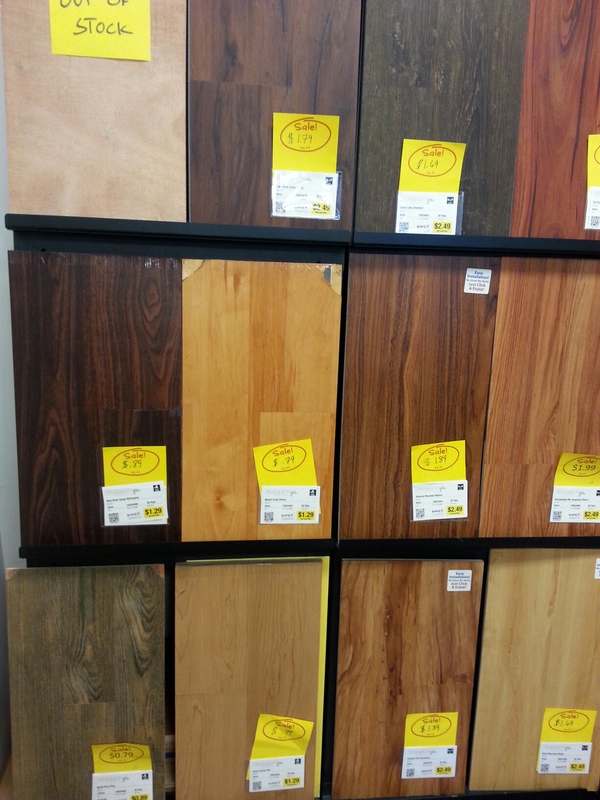 We were impressed with Lumber Liquidators – they had a lot of styles packed in a small space. And who knew that bamboo has come such a long way? Lot’s of engineered wood choices. Assistant brewer Jesse came down one day this week to help work on the back of the bar and my wife had a bunch of flooring samples to review. Between the two of them they picked out the flooring so I didn’t have to make a decision…yay! 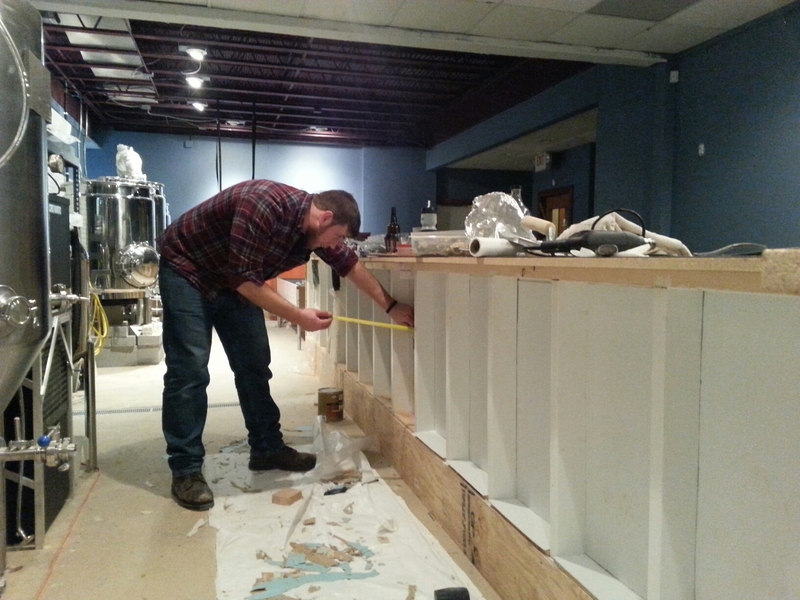 Jesse on the FRP back-bar install. If we had the money, we would have went with the bamboo for the durability, but since it ($) doesn’t grow on trees we picked ‘distressed hickory’ engineered wood from Home Depot. The online reviews were very good for the price point and it had a decent commercial warranty. Just from the last few weeks of this winter we knew we would see a lot of ice, snow and salt slop on the floors. I wasn’t about to manhandle these individually. I’ll take the pallet! 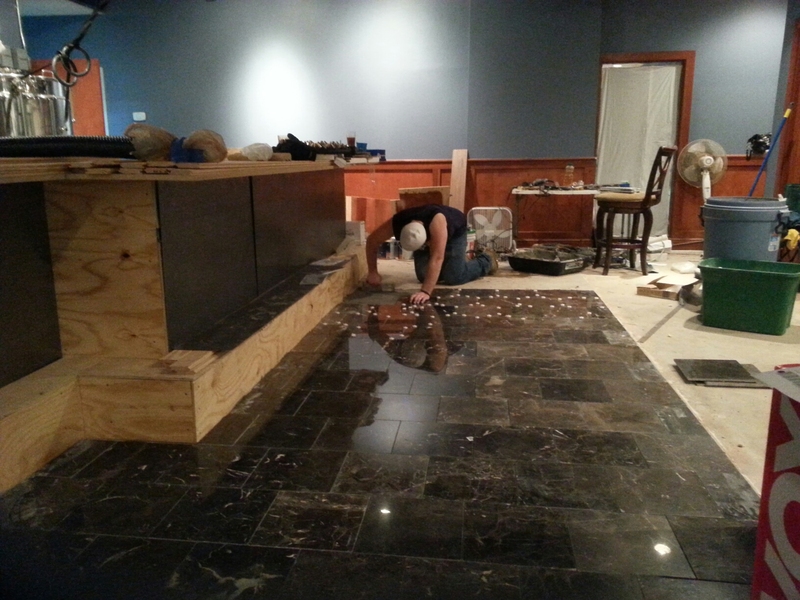 Since we decided on the floors, which needed to match the walls, it was time to decide on the bar-top – which then needs to match the floor and the walls. Aaron, from Highland Square Restoration, was a big help in this. I love a rich wood texture and the warmth it brings, and I also wanted a ‘staggered slat’ look. He pointed me towards unfinished tongue and groove three inch wide pine slats and where to get them. After a lot of texting on where to get it, how it stains, to the edges (square vs. microbevel), I got some at Terry Lumber in Peninsula. 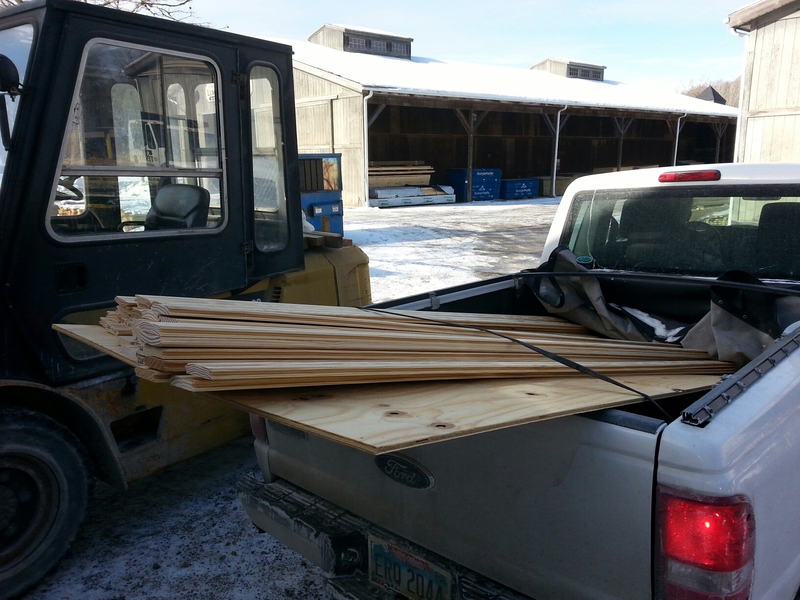 We picked this up at Terry Lumber on one of the coldest days this winter. 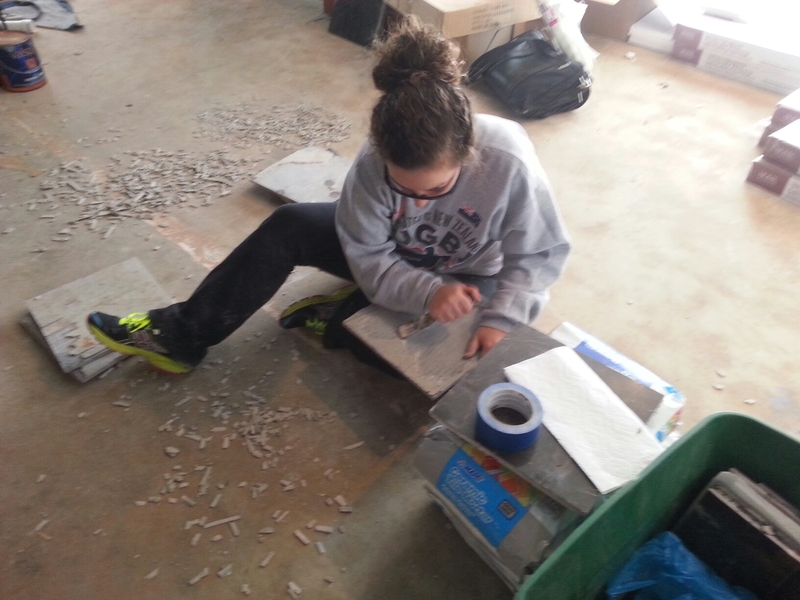 Remember all the marble tile that my wife saved…and didn’t save…near the beginning? Well we finally were able to lay it down. She was able to find and order some new tiles as we did have a shortage. At $5 per tile, all the work that went into saving them at the beginning was definitely worth it. 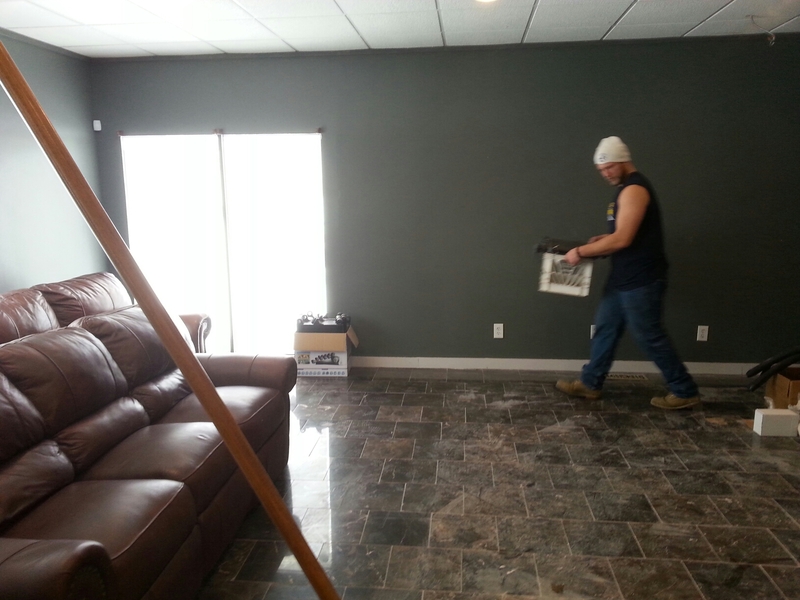 So the tile came in this week and we had Rebecca and Jesse down to finish the job. Removing the old concrete from the tiles we were able to save. 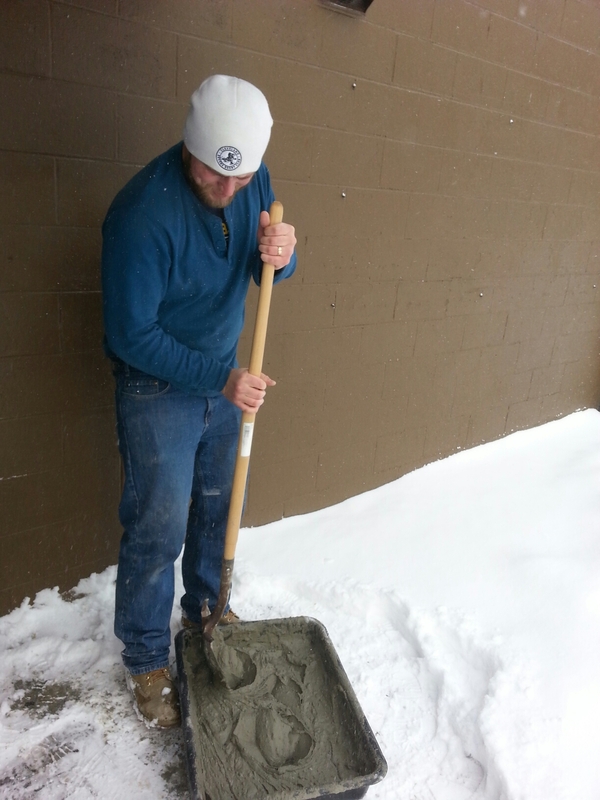 Great weather for concrete mix’n. I took my Dad’s and other’s advice (my wife mentioned this to me months ago and I wasn’t agreeable to it) to run the beer draft trunkline – three inch diameter, through the drop ceiling instead of around the bottom of the bar into the cooler. I didn’t want to cut a trench for the line. 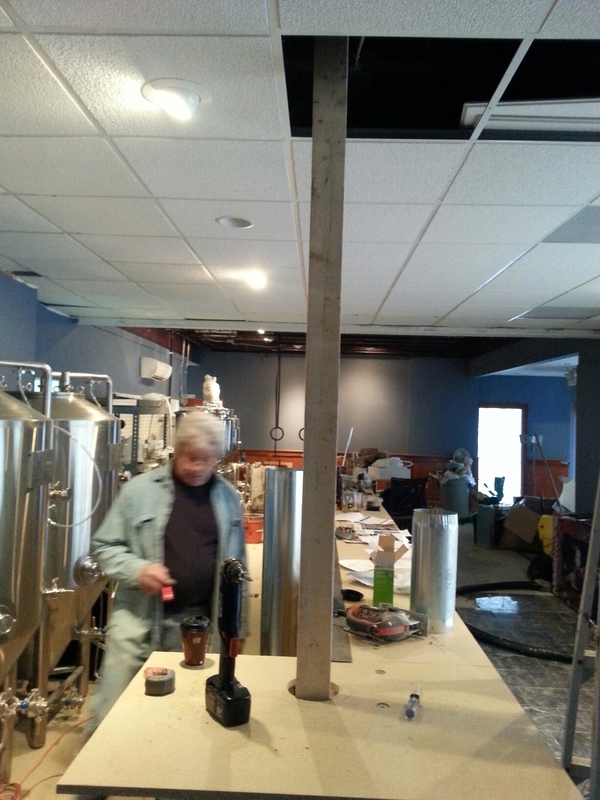 We decided to run the glycol-cooled beer lines through the drop ceiling into the cooler. Guess who got this job? We also called John and my Dad this weekend to help cleanup the place and get rid of a lot of stuff we didn’t need since we are mostly done with the updates. We moved in a few couches for the side room too. Also try to lay the bar top pine. This was a big week involving a lot of man and woman power. Many thanks to my Dad for his continued work, John, Jesse and Rebecca, Aaron and my wife. First meal at the bar.